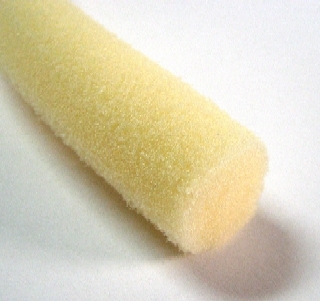 PRODUCT: 1-1/8" DIAMETER FOAM BACKER ROD, OPEN CELL, YELLOW COLOR. 300'/BALE, 2 BALES/MASTER BAG (600 feet). MEETS ASTM D5249, C1330 D1056. PRICE/MASTER BAG. (UPS Shipping only). Highway construction, and pavement maintenance. Hot pour applications, up to 500F. Yellow round, soft, polyurethane extruded open cell foam. Compresses up to 80%, 25% is recommended.